“Deadheading” to a gardener means removing faded or dead foliage and flowers, plus seed heads as they develop. 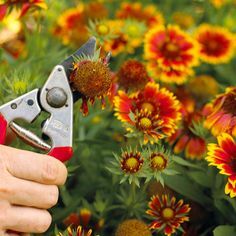 You may need pruning shears to accomplish this task, or you may be able to pinch off the old plant parts with your fingers. Removing faded flowers and leaves makes a huge difference in the look of the garden and in repeat blooming. If your flowers become too tall and leggy, or flop open in the middle, try shearing them back to 6-12 inches above the ground. This type of haircut causes them to branch and become stockier. Deadheading is truly a secret task that experienced gardeners perform faithfully. When friends and family view our lush gardens they exclaim, “Oh my, you have such a green thumb! Everything is so green and alive!” We just smile and secretly tell ourselves the two simple words that became one special word … Deadhead, Deadhead, Deadhead! Remember, most flowers will look better if you remove the faded flowers. As a bonus, many flowers will also push out another cycle of blooms after deadheading. Deadheading an Arizona Sun Gaillardia.